After more than a year in research and development, we are proud to announce the completion of our new model AGT800 Laser Thickness Gauge. The AGT800 is a revolutionary online gauging system that can measure virtually any strip material from .040 to .750” (1 to 19 mm) in thickness. There is no radioactive source, and no federal or state licensing is required. Our first production version is for a 96” x .750” Butech stretch leveler/CTL line, and was shipped last month. How do you know if the new laser gauge design is a good fit for your processing line? Do you process steel greater than a quarter inch thick? If so, the laser model will have much less electronic noise than an isotope gauge, and be able to measure thickness up to .750” (19 mm). 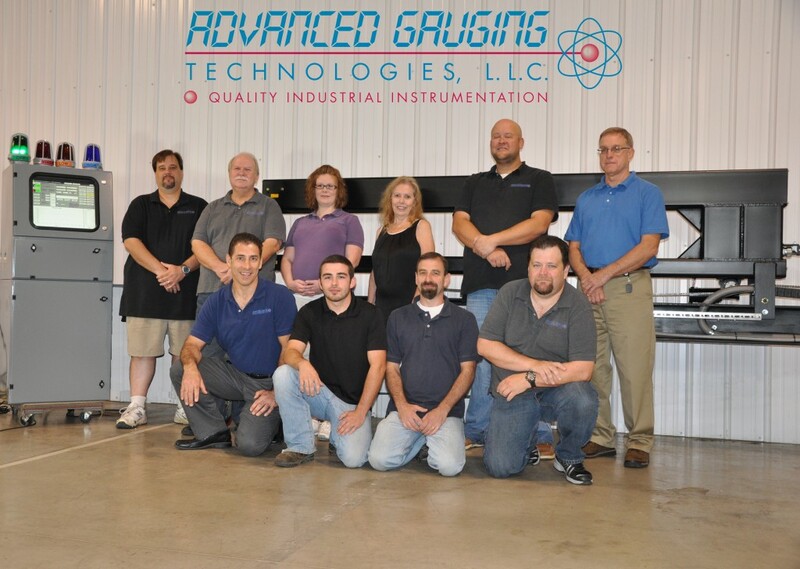 Do you want a thickness gauging system that has no material or alloy sensitivity whatsoever? Our laser gauge will automatically measure virtually anything, from steel to aluminum to wood to glass, with no adjustments required. Are you tired of dealing with an old inaccurate, unreliable x-ray thickness gauge? The AGT800 laser gauge features very similar architecture to the AGT400 isotope gauge. Our gauge design incorporates the cleanest user friendly interface, highly reliable measurements, best coil reporting and data storage, and most advanced diagnostic tools of any gauging system in the metals industry. Do you have a dead or dying x-ray thickness gauge, and you don’t want to pay an exorbitant repair bill? Ditch your x-ray system, and step into the future of thickness gauging. Can you control your passline height to within +/- 25 mm (1”)? This is required for laser thickness gauging. If you answered yes to any of the above questions, or would like to receive additional information or a budgetary proposal, please let us know. Our current lead-time is three to four months. Not pictured: Michael Bertin, Ph.D. I just want to take a moment and say “THANK YOU” for allowing us the opportunity to serve you. In today’s hectic business world, we don’t always make the time to express our gratitude as often as we should. Our time, like yours, is constantly interrupted by changing schedules and priorities. We always seem to be focused on taking care of the important business of the moment. With that being said, we recognize that our number one priority is to take care of you, our customer. We strive every day to provide you with the best service possible and we take pride in always being there when you need us. With that said, please feel free to contact us at any time should you ever need our assistance. On behalf of all of us at A.G.T., let me once again say “THANK YOU”. Most of our customers have network capability in their plants and more coil information is available now than ever before. The AGT400/800 can write a coil data file to the plant network via a network connection after the coil is finished, but how about the other way? What data can be sent to the gauge to make operating easier? We have a feature called AUTO DATA ENTRY (ADE) that allows for setup of coil data to the gauge. Several customers already use this feature to streamline gauge operation. ADE allows the customer to use a digital input and a network connection to enter coil data that normally would by typed by the operator. The way it works is pretty simple. The customer’s computer generates a 13 line ASCII text file that contains the 13 pieces of information the operator would normally type in via the keyboard. This file is stored in a location known to the gauge. When the digital input is received either from a physical switch or from a PLC contact, the gauge goes to the location of the file and reads the contents. The contents of the file are loaded into the gauge with a single throw of a switch saving the operator time. Saving two or three minutes for each coil may not seem like much unless you consider it over the shift. Two or three minutes over 10 coils is 20-30 minutes the operator could use to increase his productivity. If you have any questions about AUTO DATA ENTRY or about coil data generated by the gauge please contact A.G.T. or ask your service technician during your next scheduled service. It’s important to always remove the C-Frame before tailing out. This prevents costly damage to the measuring heads.